The AT Pro is Garrett’s all-new, all-terrain, all-treasure,deep-seeking, professional treasure hunter’s detector! This all-terrain detector offers new and exclusive Garrett technology that makes it ideal for hunting coins, relics, caches, jewelry, and even gold nuggets. Select from either Standard or Professional search modes with enhanced audio features. The AT Pro is also engineered with a waterproof housing and connectors to protect in dusty, muddy, wet and humid environments. "With advanced audio target information...digital Target ID...its enhanced ability to separate targets from trash...all terrain operation...our new AT Pro is an outstanding multi-purpose detector for coins, jewelry, relics, caches and even prospecting." Scattered iron objects in the ground can mask good targets and even create “ghost signals” that appear to be a good target. Garrett’s selectable Iron Audio feature allows the user to hear discriminated iron (normally silenced) in order to know the whole picture and avoid being tricked into digging an undesired target. Normal division of low, mid and high tones on AT Pro. Iron Audio is set to OFF. With the iron discrimination set to 20, all targets below 20 are silent with the Iron Audio OFF. 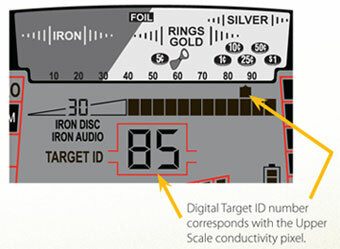 With the Iron Audio feature ON, the targets below 20 are now heard as a low tone and the mid-tone is expanded down to 20. Click the button below to add the Garrett AT Pro Metal Detector - DEMO to your wish list.